Abstract : We report decoupling of two closely located resonant dipole antennas dedicated for ultra-high field magnetic resonance imaging (MRI). We show that a scatterer slightly raised over the planeof antennas grants a sufficient decoupling even for antennas separated by very small gap (below 1/30 ofthe wavelength). We compare the operations of two decoupling scatterers. One of them is a shortcutresonant dipole, and the other is a split-loop resonator (SLR). Previously, we have shown that the SLRoffers a wider operational band than the dipole and the same level of decoupling. However, it was so foran array in free space. 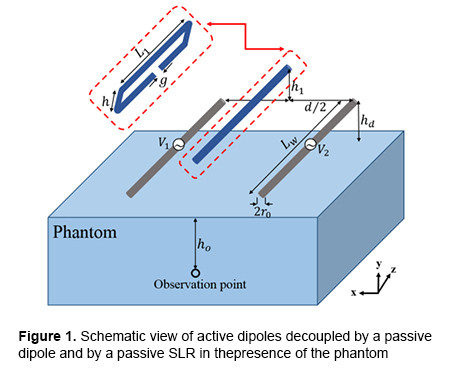 The presence of the body phantom drastically changes the decoupling conditions.Moreover, the requirement to minimize the parasitic scattering from the decoupling element into thebody makes the decoupling dipole much more advantageous than the SLR.